Rev. Earl Hendrix With The Lord! Southeastern College shares our love and support for the family and church family of Earl Hendrix. This morning, Nov. 8, 2017, Rev. Earl Hendrix experienced victory as he entered the presence of the Lord! Bro. Earl was one of the founding pastors who served on Southeastern Free Will Baptist College’s first Board of Directors. The following is a re-post of what First Free Will Baptist Church of Inman, SC expressed this morning when they announced Bro. Earl’s home-going. It is with great sorrow, yet with much peace, we announce that our shepherd for so many years, Rev. 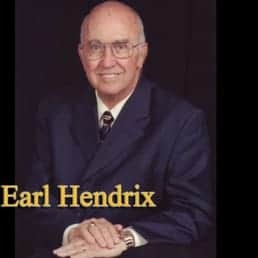 Earl Hendrix, has gained his eternal healing. He got to meet his Savior, for which he so longed, at 2:15 this morning. There will be a void like none other in the days ahead, but rest assured, we take comfort in the fact that he is safely in the arms of The Almighty. Please keep his family, our church, and this community in your prayers as this is an immeasurable loss for us here on this side of Heaven. But today, Heaven is much sweeter, and we must rejoice. Friends, what we would like is for the legacy of Preacher Earl to flood Facebook, and your conversations, in the days ahead. So, please comment on this post how Preacher Earl has impacted you, where you met, funny stories, etc. We will use your comments/pictures, in some fashion, for the service.